Every where in North Indian til (sesame) is the prasad for Sankranti and ladoo is the most popular preparation. The process for the ladoo preparation in olden days was time consuming and labour intensive.Jaggery and roasted groundnut was pounded in huge mortar with wooden pestle and then roasted til (sesame) was added and pounded again till the mixture comes together and made into balls .These days the entire process takes no time with the use of food processor. I can bet this will be the most easiest ladoo recipe you have ever heard of. This is tasty and healty too. Use Food Processor and process jaggery and peanut together till peanut grinds well. Add TIl and process till everything mixes well and til is powdered . Take the mixture out and make small balls . Store in airtight containers . PS: If your mix is not coming together while making balls add a few tbsp of milk. But then make sure to store the ladoo in fride. Till ladoos look very yummy. 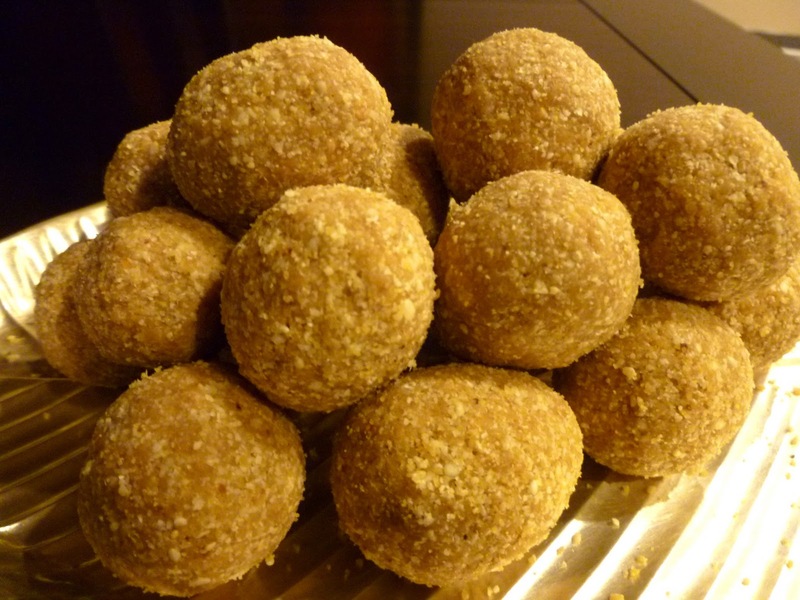 Cute looking laddoos, i dont bother to have some rite now..
That looks very refined and extremely enjoyable..will try it! Hey..The Laddo looks prefect and yummy...best for festival...thanks for visiting my space and for lovely comment...First time here..your space is very nice..loved it....happy to follow you.. I am not able to follow your blog...there is some error....very sad.. These laddus look so perfect and yummy..Happy Pongal to you and your family!! Sure is the easiest ladoo recipe Nisha. Happy Sankranti to you! 1st time visitor and a follower too. Pls visit my blog, I am a new blogger. I like this easy method of making Til Laddu. Please give the measurements to make 50 laddu (how much til, peanuts, and gud I need). I hope to here from you before the Jan. 14, 2012.